Hall of Gods is a Net Entertainment progressive jackpot video slot with 5 reels and 20 paylines. Like many other popular games, it’s based on Norse mythology (such as Thunderstruck II). It features the Gods such as Odin and Thor amongst others. The betting range is from 20p a spin to £50 a spin will all paylines enabled. 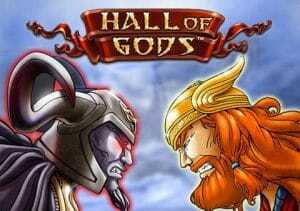 Hall of Gods is an appealing game in that has 3 features. Firstly you have the Expanding Wild feature – when you see the Midgard Serpent wild symbol on the 3 middle reels (2, 3 and 4), the wild will expand to take over the whole reel. This will obviously help achieve bigger win amounts from your spins. Then you have the Free Spins feature which is triggered by getting 3 or more Odin’s Raven symbols (the scatter). Getting 3 scatters will give you 10 free spins, 4 scatters will reward you with 15 free spins and getting 5 scatters will give you 20 free spins. So you can get between 10 and 20 free spins initially. Furthermore, all number of free spins have a 3x multiplier attached meaning that win amounts are trebled. Fancy extra free spins? Get 3 or more Odin’s Raven symbols and you will earn more. Finally, you can activate the Pick Win feature. The Pick Win feature is where you can win the huge progressive jackpot. The bonus round is triggered by getting 3 Thor’s Hammer symbols anywhere on the reels. Thor’s Hammer is then used to break the shields on the screen – if you match 3 amounts, you will win that cash amount. On offer, there are 3 jackpots you can win. The Mega Jackpot is the top one and is currently over £5.3 million. You should also try the internet’s most popular jackpot slot, Mega Fortune, which is also powered by Net Entertainment. If you like other software providers, you can’t go wrong with the Marvel titles by Playtech such as The Avengers or The Incredible Hulk.